When it rains, it pours, huh, Google? 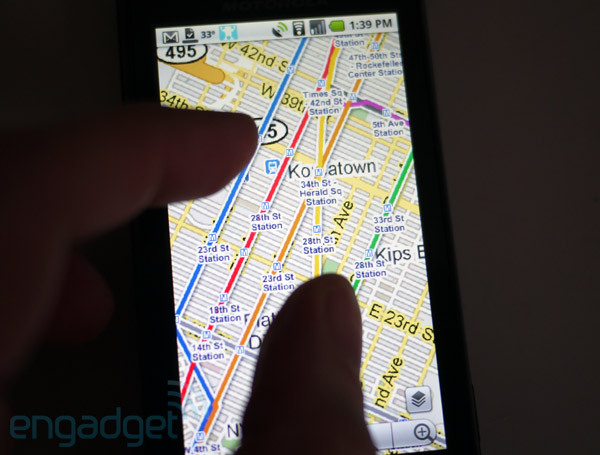 Not even a week after announcing the big multitouch update for its own Nexus One, Google has turned loose a new version of Google Maps that enables pinch-to-zoom support on the Droid. Of course, it was no secret that Android 2.0 had the framework in place to support this kind of stuff — Moto enabled it all by its lonesome on the Euro-spec Milestone — but it looks like this could be the watershed moment where multitouch finally becomes a must-have feature on Android devices across the board, as Moto CEO Sanjay Jha recently suggested would happen. The new version 3.4’s available as a software update in the Market right now, so grab it if you’ve got your Droid handy.